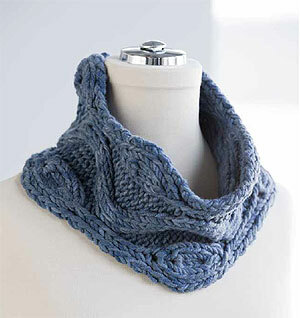 This beautiful, simple knitting pattern for a cowl that suggests the easy, natural shapes of the sea come from Knitwear Designer Extraordinaire, Michelle Miller - featured above in Artyarns Ultra Bulky in 304 and 2304 lovely, cozy 2 skein cowl plays color against color and is ultra soft and squooshy. Don't forget to check out Michelle's (known far and wide as fickleknitter) website - and yes, she really does knit tin hats. I saw one. Shown at right: 2304 tonal blue, 304 deep marine as shown in the One + One book from Iris Schreier.